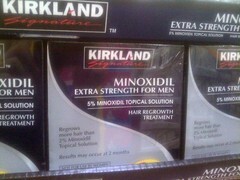 Only 27% of men who used Propecia (finasteride) said it was “very” effective. Finasteride is a 5-alpha reductase inhibitor used to treat prostate enlargement symptoms and baldness. Finasteride has 2 trade names: Propecia for baldness and Proscar for BPH. Over-the-counter minoxidil (Rogaine) is applied directly to the scalp and is the only hair regrowth drug approved for use by women. Just 4% of respondents said it was very effective, with 43% of users saying it was not effective at all. Only 2% of men surveyed underwent hair transplants; but of these, 49% were either very or completely satisfied with the results of their surgery, the poll shows. Survey: Most Baldness Treatments Don't Work. WebMD. Drugs that "shrink prostate" and treat baldness (5-alpha-reductase inhibitors) may have sexual side effects that persist after stopping them, WebMD, 2011. 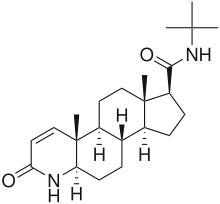 Image source: Finasteride, Wikipedia, public domain. "Ah... so you are supposed to rub it on the scalp... I've been drinking it all these years, no wonder it has had no effect"